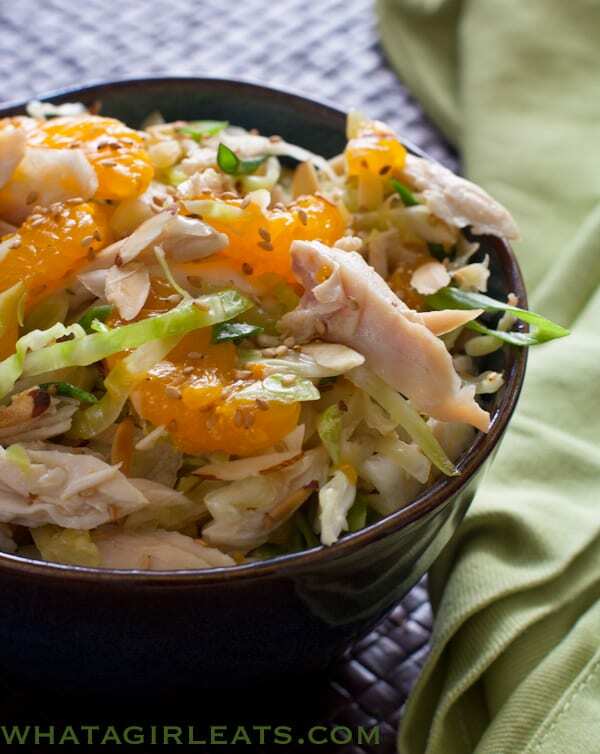 Chinese chicken salad starts with finely shredded Napa cabbage. 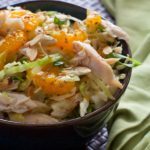 Shredded chicken breast, Mandarain oranges, scallions, sesame seeds and almonds are added, then a sweet Asian dressing is drizzled over everything. The weather is starting to warm up again…salad days are here again. I could eat a salad every day, and usually do in the summer. There are no outstanding favorites for me, because I like them all, from Greek to Mediterranean. 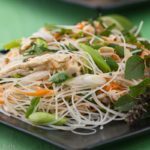 I often hesitate ordering a Chinese Chicken Salad in a restaurant though, because they can really pack in hidden calories with the super sweet dressings! I like to know what goes in my food, whether it’s good or bad. My mom made Chinese Chicken Salad for PTA functions in the 60’s, when it was considered “exotic”. A lot of Chinese Chicken Salad recipes use the ramen seasoning package and noodles. Those packets are loaded with chemicals, MSG and who-knows-what else. This dressing recipe is just as easy, but with simple ingredients. I also use Mandarin oranges that are canned in their own juice rather than “syrup”. Swap out the Mandarin oranges for fresh tangerines or diced mango, and cashews or peanuts for the almonds. I used to add crunchy noodles, and sometimes I do, but since I’m getting ready for bathing suit season, I don’t need the extra carbs. The nuts give it plenty of crunch. If I’m making this salad just for the family, I’ll add fresh chopped cilantro. If I’m making it for a big group, I omit it, since cilantro seems to have a small fan base. The good thing about using cabbage is that it holds its crunch a lot longer than lettuce, so you can make it an hour or so ahead of serving. It will even taste good the following day for lunches. 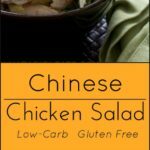 This recipe makes a lot of Chinese chicken salad. It’s my “go-to” salad for baby and wedding showers and will make 8 luncheon portions. 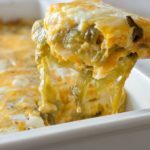 If you’re serving smaller portions as a side dish for a picnic or BBQ, it will serve double that. 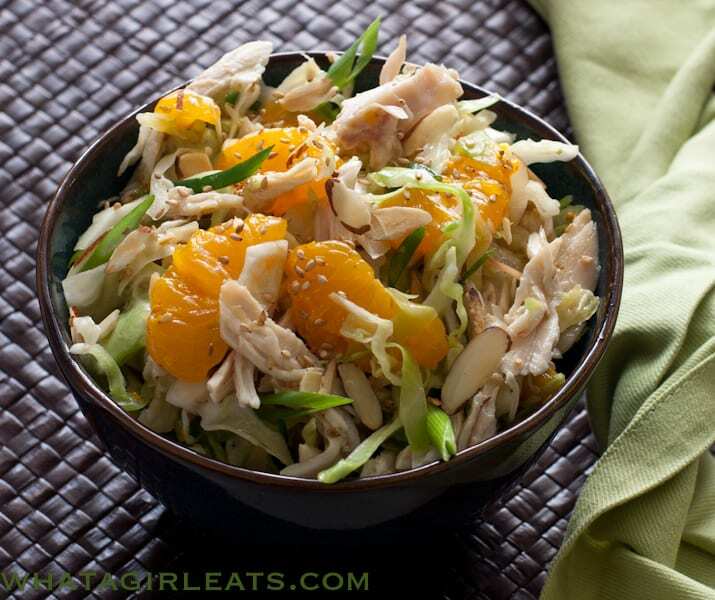 Crisp cabbage, shredded chicken and mandarin oranges in a slightly sweet dressing. *To save time you can buy bags of pre-shredded cabbage in the produce section. 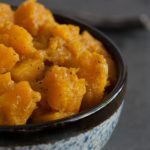 Combine the first 7 ingredients, rice wine vinegar to vegetable oil, in a small sauce pan and heat over a low heat just until sugar is dissolved. Let cool and refrigerate. 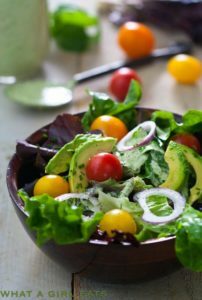 For the salad, combine all ingredients in a large bowl and toss with dressing. Chinese Chicken Salad. 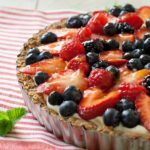 Light, healthy and delicious! Gluten free. This sounds so good. I remember your mom making it back in the days. I will try it soon. Being that my Dr. told me I was a little to chubby a couple days ago I will try and take off a few pounds first. I love your blog and all your writings. Elaine, try staying away from wheat products, cookies, bread, cakes, etc. for a couple of weeks…The weight will slip off! Love this salad! Sesame oil is to go crazy for! 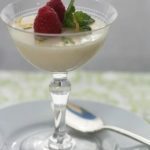 Will make this soon – or will have hubby make it which is even better. Great stuff! Denise…sometimes I add crunchy stuff too! Fried won tons, crispy noodles! I would say 8-10…I like the toasted seeds and nuts for the flavor, but you can buy pre-toasted nuts from Trader Joe’s. @Maggie, Totally with you on that! Instead of sugar, substitute with half the amount of honey or agave. If you want more ‘crunchies’ add some water chestnuts! Recipe sounds great! @Elisabeth, good suggestions! I’m not much of an agave person…Honey would be nice. One of my most favorite salads. Love the mandarin oranges! I love making calorie “bombs” healthier David! 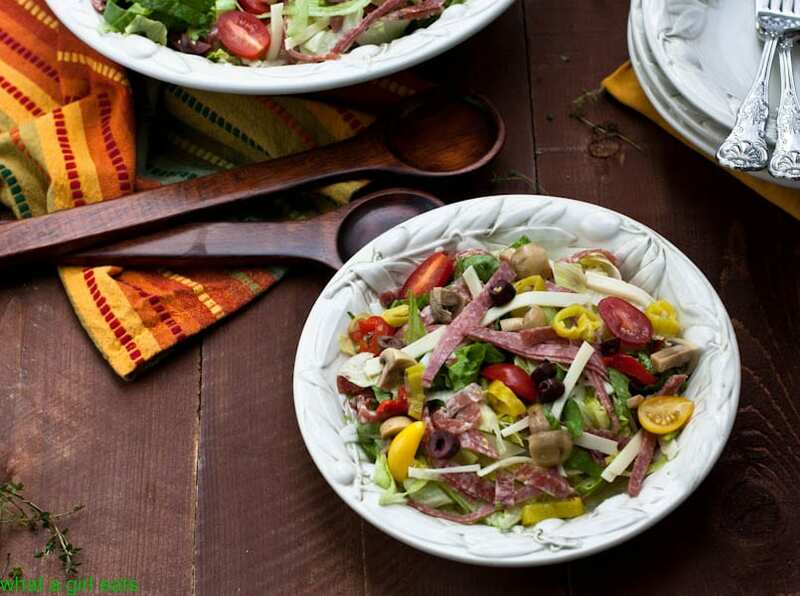 what a flavorful salad! And I love that it is so versatile too. I love this recipe. I know the dish you describe from the past, I love it and can’t help but eat it when I see it. But I have wanted to make my own healthier version. You’ve done it for me. thanks Michelle…a lot of teachers bring the ramen seasoning packet version to school and it’s just loaded with chemicals and sodium…this one is simple and yet still delicious! I’ve actually never made an Asian style salad at home. Of course, when I order one at a restaurant, inevitably, I’ll say, “Why don’t I ever make this at home?” Getting in a rut and being a creature of habit is not good! I really need to try this at least once! Thanks for the inspiration and recipe! You are my hero for making this without the salt-laden bomb that is a ramen seasoning packet! This is going on my “to make” list soon! Definitely a classic! 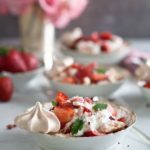 Light and refreshing – perfect summer fare! I agree Christy…definitely a summer time salad! Carol, one of my family’s favorites! This is a family favorite, I love it! The mandarins make all the difference. So true Fabiola! 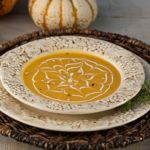 I’ve used oranges in a pinch, but the mandarins make it! 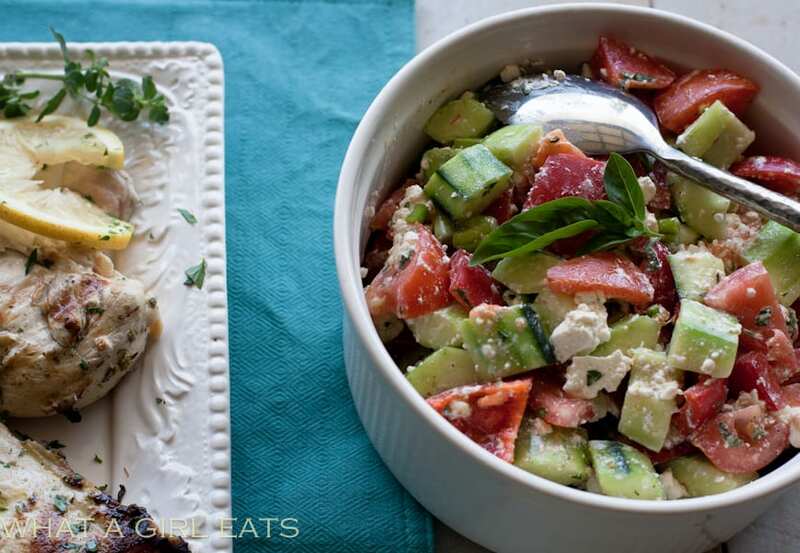 Crunchy, flavorful, crowd-pleasing picnic goodness! yes Steph! And it holds up reasonably well since it’s made with cabbage instead of lettuce! I rarely order Chinese chicken salad too but your version is so fresh and I love the swap suggestions you make. 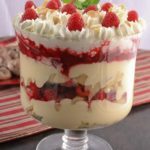 Thanks Susan, I try to make these calorie bombs at home so I can control the ingredients! I love Chinese Chicken Salad, but never think to make it at home! Your version looks so yummy – perfect for weekday lunches! 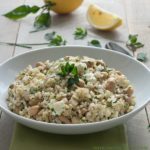 Faith, this is one of my favorite salads, and I like being able to have a healthier version at home! Sounds so healthy and refreshing. Orange and chicken make such a great combo! One of the girl’s favorite’s matt! This looks spectacular! Thanks for the recipe! 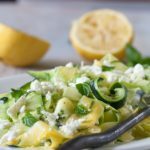 This salad is so light and refreshing! It’s perfect for spring…yum! This sounds great – I love all kinds of salads too. I can’t wait to try this with each of your substitutions. 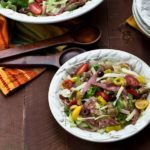 Salad ideas for days! 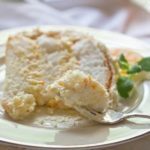 Looks very tasty and easy to prepare, thank you for sharing this recipe. thank you Florentina!It’s one of my favorites! Cynthia, this one looks awesome! I’ve featured it in my new post today and I hope it’s ok! This looks so fresh and delicious! Would love this for lunch! Oh my, this sounds and looks fantastic, I am playing around with lots of Asian flavours in my salads at the moment, this sounds like a great one to add to the mix.